This blog just turned 5! Here's a few things that I've been writing over the course of the last few months. There's not really a single narrative here, just a small collection of random thoughts of mine. I hope you enjoy. Not a bad place to spend a Saturday afternoon. As I made my way towards the media entrance at the back of the old pressbox at Michigan Stadium on October 17, 2009, I made sure to have my credential in a highly visible spot so no one would suspect I was just some schmuck who was lost or something. I hesitantly glanced at every stadium worker who's job it was to make sure my media pass got me into wherever I was going. They would just look at me, look at my pass, look back at me and offer a "Hello." or "Good morning." or just a nod and a smile. I made sure to act completely calm and at least appear as if I had done this a bunch of times before. But on the inside, I was feeling about 109,901 different emotions all at once. I was almost certain that at any moment, one of the pressbox workers was going to grab me by the arm and ask me where the hell I thought I was going, and then large men in black suits and sunglasses would find a back door to kick me out of. Being a sports blogger is a lot like nothing else. There's not really a lot you can compare it to. It's kind of like saying "I'm not really a doctor, but I play one on TV." On one hand, you're an egotistical, self-indulgent prick who needs to be told that your opinions matter. But on the other hand, you're just a die hard fan (who's nerdy enough to run a website) who writes for fun because it's a passion and you love sharing it. For me, it's definitely more the latter than the former. I think. I started doing this thing five years ago. Since then I've learned a lot of things about myself, about how I view being a Michigan fan, about how I care a lot or not at all about certain things, about how much more I understand about the power of words – and their ability to unite or divide. How trivial and important sports can be in the grand scheme of life – and how that's really a good thing. And most importantly, how it's all about perception. I'll be the first to admit that I never really considered trying to cover a Michigan football game five years ago. I'll also be the first to admit that I had no real idea what I was doing. I knew I had a passion for Michigan football. I knew that passion was unique. And I knew that there's a special place for the side of sports that doesn't really get reported by ESPN or local newspapers. College football, maybe more than any other sport, is defined by it's fans. And almost no school has more fans than Michigan. The Wolverines are well represented in the blog world. There are many great blogs that have been around for years, and new ones popping up all the time. You'd think there would be a saturation point, and there might be, but every blog is different – because every blogger is different. We all have our own voices...and our own perceptions. I don't want to make this all about how great blogs are. But the point I am reaching for here is, blogs have their own place in the sports journalism world. We're not here to replace traditional sports writers. We're here to compliment them. To offer up ideas and opinions that would never get past the editors inbox at a newspaper or network. Some opinions are better than others, but we put them out there and let the internet decide what's good and what's not. Darwin-style. The first game I covered was Delaware State in 2009. I had requested credentials before but with no success. So when I finally got the green light for Delaware State, I figured this was just the media relations office trying to shut me up. I can recall almost everything from the first game I covered...right down to the minute. What time I arrived, where I went, what I saw, who I met, what I felt. To me, I was just ecstatic that I had the opportunity to go up into the old pressbox. The same pressbox that millions of fans have probably wondered to themselves over the years what it's really like up there. And I was about to find out! How was this happening?! To be honest, the old pressbox was pretty shabby. Especially by 2009, with the new gargantuan pressbox's steal girders looming behind and over top of it...the old place had been pretty neglected. It was still operational of course, but just barely. The old pressbox was dedicated in 1956, and it was showing it's age. Exposed cables were running everywhere – pinned onto the walls and draped. Things were taped into place. The cement block walls had about twenty-five coats of pain on them. There were small heaters, but they didn't work very well. The chairs were rickety and the desks were falling apart. And of course, space was at a premium. But there was a certain charm about it. The place looked and felt used, but cared for. I remember vividly an overwhelming feeling of respect for everyone I saw and met. Because everyone who was up there looked and felt like they belonged there. It was their office, their home. And it had been forever. And I was just some blogger who was allowed to spend a Saturday afternoon there. A true outsider. But I was there. For that day, I was one of them. I had a job to do, and that day my job was to experience this. Traditional media members covered what was happening in the game, and in a small way I did to. But they had real-life deadlines and stat sheets and stories to write. All I had were memories to build and stories to share. I had to let this experience wash over me as much as possible because in my head, this was probably the only time I'd ever get to do this. I got to the stadium as soon as it opened, about 3 hours before kickoff. I sat at my seat on press row and pinched myself. I went up to the photo deck that overlooks the field and pinched myself. Then I wandered down to the field to take some photos and pinch myself. Eventually, I came to the realization that this was really happening. The game was a blur, I remember almost nothing about it other than the final score. But I remember little things. Like how slow and crowded the single elevator was. And when the elevator doors opened you were immediately greeted by a wall of old black and white photos of former media members, the media wall of fame. The whole place smelled like popped popcorn. The photo deck was way more cramped than it looks from the stadium bleachers. And the media veterans are pretty serious about what they do. They're there to work. The rules are pretty simple. No cheering allowed. And even though from time to time some less-informed few break that rule, it really does feel like an office. An office with one heck of view. The new press box is nothing like the old one. In a lot of ways, that's a good thing. Once where there was nothing but air, now stands a monument to college football. You would be hard pressed to find a more suitable and luxurious press area at any major college football venue. I've only limited experience of course, and I might be a little biased, but I know what I've read from folks who've been around. And they all seem to agree that Michigan did it right when they designed the new digs. The seating area for press is considerably larger than it used to be. There are nice comfy chairs and plenty of desk space. Storage for coats and bags. Power outlets, once a luxury, are now everywhere for every one's laptops and gadgets. 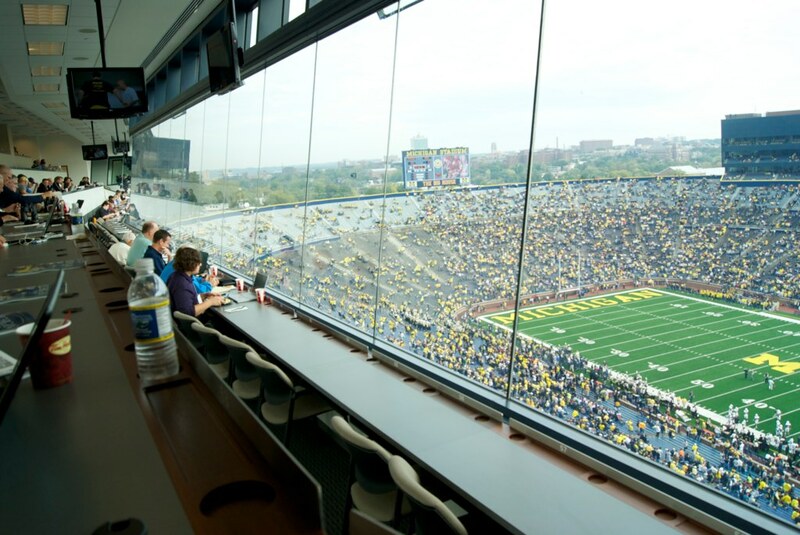 Behind the press seating is an open area with equally spectacular views of Main street, Pioneer High School, and the western treetops of Ann Arbor. This area is pretty heavily traversed by stadium workers, caterers bringing food, media people/broadcasters conversing, coaches coming to/from their booths to/from the field. There are no public suites in the press area, so everyone up there is working. Everybody is busy. You'd think being a blogger, I'd just be happy being there – not so focused on much else than just taking it all in. And in many ways, that's still the case. But having covered a few more than a dozen home games, a road game, the Big Chill and a few spring games, the shine still hasn't worn off for me. Not at all. But being in such an environment and around the people who work up there, you quickly realize that you're there for a reason...not just to experience this, but to report it, to cover this event. And for someone like me, how you cover something like this can be as varied as the kind of blogger you are. There are a handful of us blogger-types up there, we all see and experience the same things, but how we report them can be very different. Five years ago, I started this site to bring yet another voice to the already crowded arena of the Michigan football internet commentary. With what access to the program I've gained in that time has only given me a better perspective to write from, but hasn't changed who I am or what I feel is important. As newspapers continue to disappear and the internet continues to grow, I hope that the voices that cover Michigan football – Michigan sports in general – can continue doing so. Because whether its a seasoned columnist, a beat writer with years of experience and training, or just a blogger...varied opinions matter. People want to read them. I don't see public interest in college football waning in the near future. But print journalism outlets are in a state of rapid change. People don't pick up the newspaper to find out what happened yesterday anymore. People want their news now. And with sports reporting, it's no different. Show me a sportswriter who's not on Twitter and I'll show you someone who's not going to be a sportswriter much longer. As I pass the 5-year mark of doing this, the overwhelming feeling I have is one of gratitude. Maize & Blue Nation would be nothing without loyal readers and a community to share them with. There are a host of Michigan blogs, one's which I link to often, which do great work. This blog would not be where it is today without the help of some of these other sites. Greg Dooley from MVictors runs an amazing blog discussing the treasured history of Michigan football. His work goes a long way in keeping that history alive and accessible for all of us. Brian Cook is the superstar that everyone knows. If Michigan blogs have a mother ship, MGoBlog is it. A huge portion of my page views come from there. The MZone is another great blog, one of the originals. That site really helped inspire the one you're on right now. And Hoover Street Rag – I'm a huge fan their writing. There are a few now defunct blogs that also helped inspired this one. Varsity Blue, Michigan Sports Center, Ronald Bellamy's Under-Achieving All-Stars (one of the best written blogs I've ever read). Some of these guys have moved on to other sites, but some haven't. I could go on and on. But suffice it to say that I am honored to be a part of this community of Michigan blogs that do such great work on a consistent basis. The lifeblood of any blog like this is the readers like you. And when you share what you read, that helps us grow and make it possible to keep this going. I hope that you will continue to visit this site and share what you see here. We've recently added a new writer to this blog who covers recruiting for us. Who knows how this blog will continue to grow, but I am really excited to see where things go from here. Thanks for reading, and Go Blue! FIVE YEARS? Your readers are full of gratitude, too, for your labor of love. When you first started writing, it seemed so good I wonder whose writing you had "borrowed." (Wow, was I wrong!) You've outlasted plenty of other bloggers, beat reports, critics, fairweather fans...even a whole recruiting class and a coach or two! Keep up the impressive passionate/entrepreneurial blogging work.